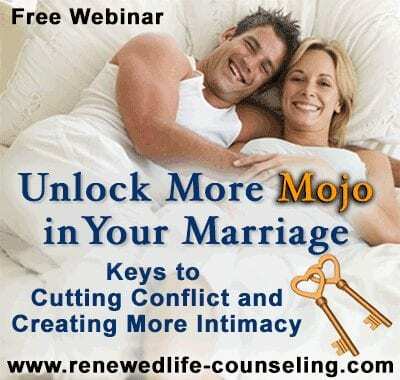 Renewed Life Counseling relationship therapy| couples therapy| marriage counseling| Denver Littleton, CO.
Do You Self-Sabotage Your Relationships? If you are seeking a marital counselor I find marriage counseling typically is an “inside job”. Conflict and tension in a relationship most likely is caused by both parties bringing unresolved issues from their family of origin or past into their relationship. Repetitive patterns and subconscious programming gets triggered. These wedges need to be examined so that genuine changes in behavior can occur. Clearing out individual emotional wounds can bring freedom to manage and make behavioral changes in their relationships without former triggers. I would advise a single person to do inner work in order to attract a healthy relationship. The subconscious part tends to attract similar types that resemble their primary caretakers. Awareness of these patterns allows the emotional release work to reach the root cause that keeps attracting unhealthy individuals.